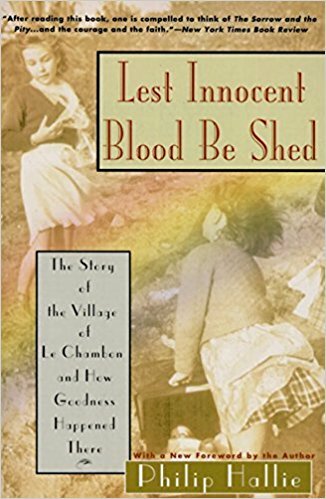 Philip Hallie’s marvelous book Lest Innocent Blood Be Shed tells the true story of Le Chambon, a French town where Pastor André Trocmé’s church, under the Nazi occupation, provided Jews with food, shelter, protection, and means of escape. Despite the disapproval of many, Trocmé and his church persevered in doing what they believed was right. As a result, “Le Chambon became the safest place for Jews in Europe.”  Over a period of about four years, the church rescued nearly twenty-five hundred Jews. When I lay on my back in bed with my eyes closed, I saw more clearly than ever the images that had made me weep. I saw the two clumsy khaki-colored buses of the Vichy French police pull into the village square. I saw the police captain facing the pastor of the village and warning him that if he did not give up the names of the Jews they had been sheltering in the village, he and his fellow pastor, as well as the families who had been caring for the Jews, would be arrested. I saw the pastor refuse to give up these people who had been strangers in his village, even at the risk of his own destruction. Then I saw the only Jew the police could find, sitting in an otherwise empty bus. I saw a thirteen-year-old boy, the son of the pastor, pass a piece of his precious chocolate through the window to the prisoner, while twenty gendarmes who were guarding the lone prisoner watched. And then I saw the villagers passing their little gifts through the window until there were gifts all around him—most of them food in those hungry days during the German occupation of France. Lying there in bed, I began to weep again. I thought, Why run away from what is excellent simply because it goes through you like a spear? Lying there, I knew... a certain region of my mind contained an awareness of men and women in bloody white coats [committing unspeakable atrocities to] six- or seven- or eight-year-old Jewish children.... All of this I knew. But why not know joy?... Why must life be for me that vision of... children [hideously brutalized]? Something had happened, had happened for years in that mountain village. Why should I be afraid of it? The history of the human race cannot be reduced to the Holocaust. There was and is considerable goodness in the world outside the Holocaust. Yet even inside it, in places like Le Chambon, a costly and beautiful goodness lives. Excerpted from If God Is Good: Faith in the Midst of Suffering and Evil. Read more about Le Chambon from the United States Holocaust Memorial Museum. Philip Paul Hallie, Lest Innocent Blood Be Shed (New York: HarperCollins, 1994), 4. Hallie, Lest Innocent Blood Be Shed, 129. Hallie, Lest Innocent Blood Be Shed, 110–11. Os Guinness, Unspeakable (San Francisco: HarperCollins, 2005), 227. I can mourn with and pray for the families in Connecticut who lost their children (and in a few cases their spouses) in the school shooting. I certainly cannot offer any definitive explanation. I’ve been attending and speaking at the C.S. Lewis Summer Institute at Oxbridge. Yesterday afternoon at one of the seminars, I talked about the problem of evil and suffering.